Q. Can you use more colours or just the 2 complimentary ones? A. Yes! Make the 2 complimentary colours dominant thats all. You wouldn't want to colour Tildas face yellow after all! Q. Do you use have to use the 'proper' colours like red and green? Q. Can I email my entry? A. Yes! Make sure you get an acknowledgement, if you haven't received one within 48 hours then leave a message in the message box in the sidebar. Firstly I'd like to say a huge Thank You to you all for entering our first challenge and hope you come back and have a go at challenge 2! I'm also really pleased to see some of you taking the plunge and creating your own blogs, well done! Next we have decided to have an award for 3 players each challenge which Rachel has kindly made for us! The design team will decide our favourite 3 each challenge and you will each get a blinky to proudly display on your blog (Don't worry it resizes itself to fit in sidebars!). It has been really tough to whittle it down to just 3 as I loved them all and the team have chipped in and these 3 are our winners this time. Well Done! Please take you blinkie below, if you need help just give me a nudge! The way this blog will work (except this time) is I will post up some tutorials, links to tutorials, hints and tips etc PRIOR to a challenge so that you can use your knowledge when the challenge is set plus it will give you time to prepare. Obviously I don't know everything so please feel free to add comments or email tips in to be added. There will also be a question and answers thread or you can email me about anything craft and blog related. Joanna has been involved in crafts for 30 years, has written over 30 books from cookery to crafts and flowers. She is best known for her craft CDs, cardmaking and pressed flowercraft programmes and can regularly be seen on Ideal World and Create & Craft TV. Her website is a gem of the latest craft goodies from stamps to CD's and flowers and pens to suit all budgets, tips and tutorials and projects galleries and if you see something you fancy its FREE postage and packing on most items worldwide! 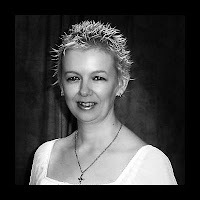 Please check out her site, apart from her shop she has a lovely friendly forum with lots to do! Joanna is offering a voucher for one lucky participant, thank you Joanna! Now onto our very first challenge! I've chosen Blossoms (flowers) as a nice easy starter as we're a new blossoming group and everybody has flowers somewhere! Stamp them, stick them, pick them or make them from scratch the choice is yours! 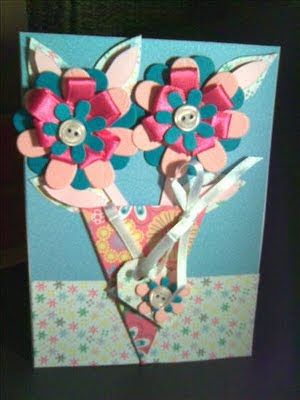 I'll show you the DT works and later on over the next week I'll highlight various ways of using flowers in your designs. If you don't have a blog, please email entries in. Please post your entries by Noon UK time on 24th Aug. The butterfly stamps are from Clear Choice stamps and are stamped with stazon onto a background I made by rubbing Distress Inks over cream card. 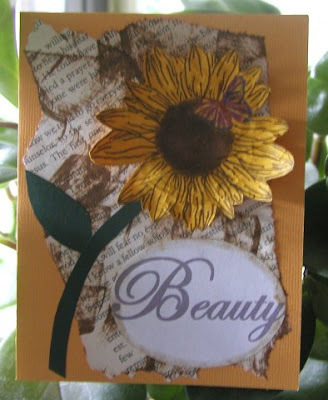 The flower is stamped onto an old book page that I stuck to some card and using a stamp that was free with Craft Stamper Magazine and then inked with the same Distress Inks (Mustard Seed, Old Paper and Walnut Stain). The ribbon and brown card was from my stash. Easy peasy! A4 card scored at 12.5cm so it creates card base off centre. 16cm light pink card, 15cm green card, 14cm dark pink card – this has been embossed with big shot flowers textured plate then glitter added. 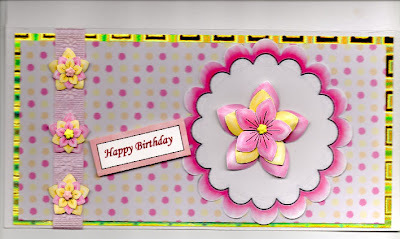 5cm x 21cm dark card again embossed with flowers plate but this time a pink inkpad used to highlight. 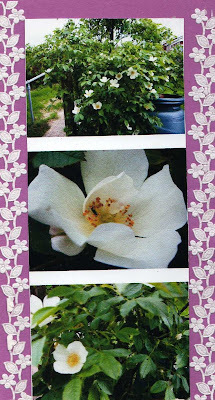 This is made up using a plain cream card to which I glued the purple backing, added some self adhesive flowery border and then put three photographs all of which show the wild rose tree which is in our back garden. I used a flower paper for the vase shape, attached a piece of card and added two more flowers topped with buttons, the main flowers are 2 flowers topped with ribbon to make another flower. A simple yet, in my opinion, effective card which with any sort of papers I am sure anybody could make. I started with a C5 size card, I used a sheet of "Hot off the Press" background paper, cut one sheet to size to cover the front of the card and use a glue roller to attach it. 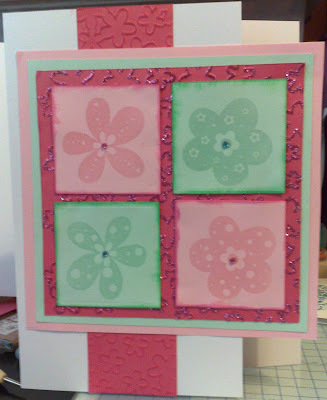 I then used a stamp I bought in a "Hot off the Press" kit and pink ink to stamp the swirls in each corner of the card. The tag in the middle is from the same kit, I cut it out and mounted it onto card (just to make it a little thicker) then attached it to the card with 3d foam. Last but not least two little gems attached to the tag on the front. 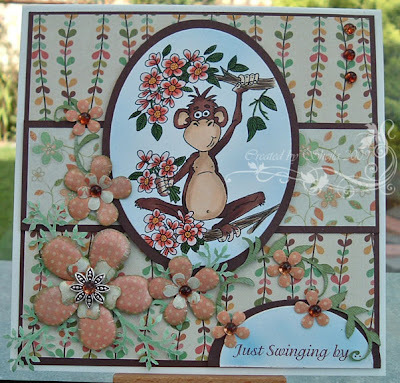 Sugar Nellie 'Blossom' stamp, coloured in with promarkers - image cut out using nestabilities scalloped oval dies and edged with distress ink. 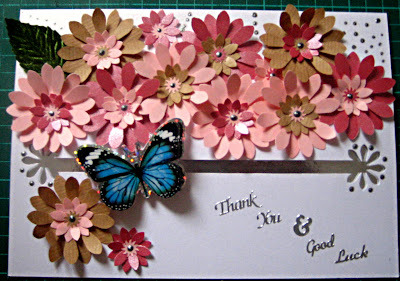 The backing paper was made using a matching flower stamp - stamped repeatedly on plain white card, coloured in with promarkers, edged with distress ink and glitter glue added to the flower centres for some sparkle. Strip of self-adhesive lace added to finish. Patterned paper K & Co, silk flower recycled, decoupage flower in centre from patterned paper, stickles glitter glue and Sakura Glitter Pen. 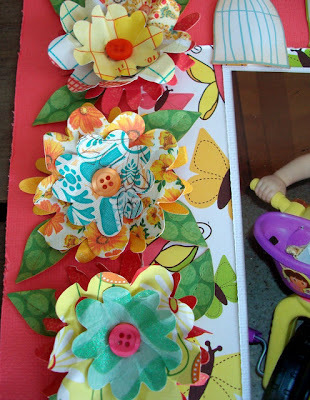 I die cut the flowers from patterned papers and then scrunched them up to make them look old and have some dimension. I only glue the centers on them to each other so they are 3 dimensional. I added bright buttons to the centers. The leaves are cut from a vine and I cut the actual leaves off and inked them to make them look old. 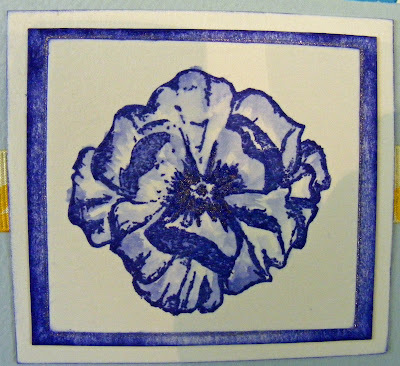 The stamp is Papermania Vintage Flower. I stamped the image using ColorBox Midnight blue from one of their option pad, onto a cream coloured cardstock, that is similar to watercolour paper. Then used a brush and water to pull the colour from the edges of the images. I love using this technique as it is so quick and easy to do. Then once it had dried I used a Sukura clear stardust pen to add a little glitter to the centre and then used a Sukura clear glaze pen over the top to add a little more shine. I mounted on the same cardstock that I have coloured using the same ink pad. Then mounted it again on plain cream cardstock. I have used the ink to edge the card mounts as well. For the main card, I wrapped a length of ribbon and added a pleated a ribbon bow, with a large brad in the centre. I mounted the flower on top and then added three brads on top of the ribbon. I thought I'd go back to my roots with this challenge and use some peel offs, I think most cardmakers start with them or will use them at some point. The peel off is from a sheet of pansies and I chose the one in a vase. I stuck them onto card and cut them out then coloured them with copic markers and added stickles glitter glue to the centres. I also added some additional pansy heads to make it 3d. Backing paper is from stash and the green I distressed with a pair of scissors (It was not happy about it I can tell you!) and then rubbed distress ink using cut n dry foam (You can also just use a sponge) I also used a pink adirondack ink around the vase and drew in some doodling. I added more pansy heads to the bottom corner and some knotted ribbon as "leaves" The ribbon was coloured with copic pens to match as were the gems at the top and peel off sentiment. Image is a digital stamp by Victoria Case which has been coloured with copic pens and I used nestabilities to cut out the oval. Flowers and leaves are punches and the centres are gems I coloured with copic pens to match. You've started making cards and things are going well but sometimes something just doesnt look right which you cant quite put your finger on.... Be honest, how many have actually read card composition and colour theory (what??) LOL! OK I'm a totally addicted crafter, I like to learn about my tools to get the best out of them and tools of making cards, scrapbooks and the like also include the use of colour. We all know that primary colours are red, yellow and blue and that red and yellow make orange and yellow and are secondary colours but do you know which of these work well together? It is composed of your primaries (Red, Yellow and Blue) Next but one are your secondaries (Green, orange and violet) and your Tertiaries which are a mix of a secondary and a primary (Red-orange, yellow-orange, yellow-green, blue-green, blue-violet and red-violet. You may have also heard the terms shade, tint and tone, what are these? • Value - How light or dark a color is. • Aggressive - AKA 'Warm'. The yellows, oranges, and reds. These come towards the eye more (spatially) and are generally 'louder' than passive colors. • Passive - AKA 'Cool'. The greens, blues, and violets. These recede from the eye more (spatially) and are generally 'quieter' than the aggressive colors. OK so what colours go together? 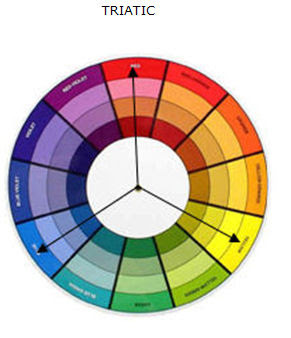 There are 6 common colour schemes used in art & design. These are Monochromatic, complimentary, analogous, split complimentary, triatic and tetradic. Monochromatic colours are all the hues (tints and shades) of a single color. The tints and shades add depth and highlights. Simply select one "portion" such as blue from the colour wheel. The example is a blue-green monochromatic. 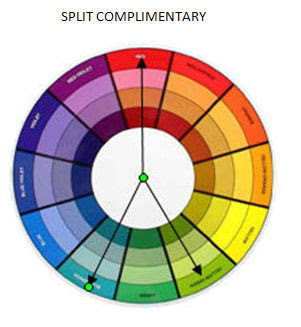 Complimentary colours are those directly opposite each other on the wheel e.g red & green; blue & orange. They look good together and compliment each other. You can use them to create sharp contrasts or mix them to create a neutral grey. These are colours next to each other on a colour wheel. 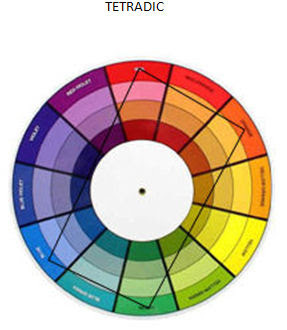 Select any quarter of the wheel for an Analogous colour scheme. As they are similar to each other they blend well particularly if one colour is used as the dominant and the others to add highlights. They create a sense of harmony and blend well together and are effective at showing depth. You will use this in your colouring such as with copic markers. The split complementary scheme is a variation of the standard complementary scheme. It uses a colour and then two colors adjacent to its complementary. It is a good choice for beginners, I use it the most myself! Probably the most common scheme used in cardmaking and scrapbooking, this involves using three colours spaced evenly around the wheel as it balances warm and cool colours. For best use let one colour dominate and use the others as highlights. It gives a strong visual contrast while maintaining balance. The tetradic (also known as a double complementary) scheme uses four colours arranged into two complementary color pairs (as in a rectangle). This colour scheme can be difficult to use in equal amounts so you should choose one of the colours to be dominant and the others to highlight. 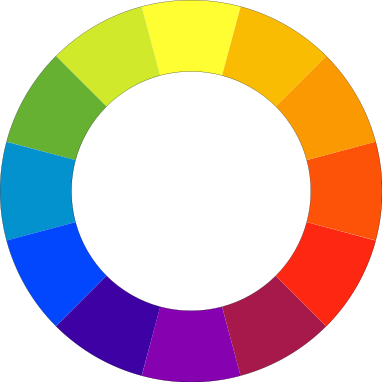 And finally below is another snazzy colour wheel showing more shades and tints. 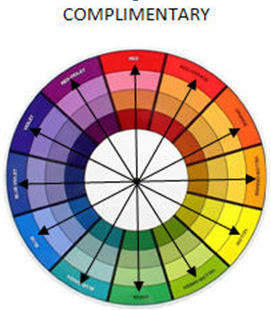 I have this one on my wall and find it really useful in selecting colour schemes. I've spied these lovely floral creations on my travels around blog land and thought I would share them with you. If you're feeling adventurous why not have a try at them! Ribbon Blossom by Judy Laing. They are fun and funky to make. Judy's is smaller than the tutorial version on splitcoast stampers here but doesn't overwhelm the card. You simply use smaller lengths of ribbon or cut them down to suit. And Celebrate by Tab Robinson. I call Tab the "Master of the Mulberry" for what she does with those mulberry paper flowers. You know the ones that are sitting in the back of your drawers with stems on that you dont quite know what to do with, well Tab has breathed new life into them with a "Bit of Glimmer mist and Glamour dust" which is becomming a catchphrase lol! Here's a couple of Lollipop Flower tutorials I also found for you. Well done sweets! Please email me your address! NOW CLOSED! 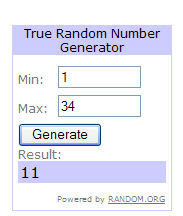 WINNER WILL BE DRAWN LATER! If you're anything like me you may have heard of the term blog candy and people asking you to visit their blog as they have candy. Now my folks taught me never to take sweets from strangers and I used to be really puzzled why people gave away sweets on blogs, I mean you don't know them, you wouldn't take a sweet from a stranger at the bus stop now would you? Then the penny dropped (after quite some time I might add!) that BLOG CANDY is not sweets, its CRAFT GOODIES!!! All those months I missed out not knowing this haha! We have got 2 MEGA huge sponsors, really big players in the world of crafts with oodles of awards, allocades and massive product ranges between them. Each day I will post up a different clue about them or their products. You need to try and guess who the two fantastic sponsors are. 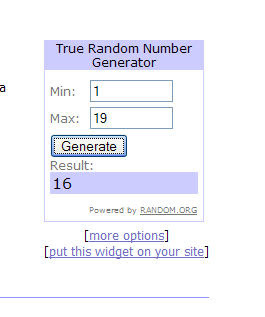 To enter leave a message in the comments box. You can make ONE guess PER DAY (email if you don't have a blog although you should be able to leave comments) and all the correct entries will go into the prize draw and a winner will be picked at random before challenge 1. 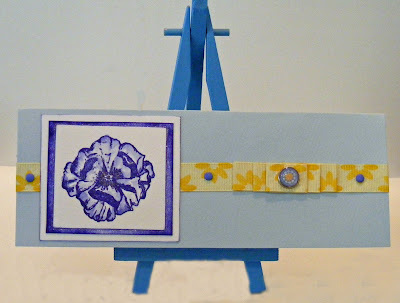 Here is the 1st item going into the blog candy box, some 3d decoupage sheets, 2nd item some peel offs, 3rd is ribbon, 4th is a cling rubber stamp by Sarah Kay for Stampavie called ""Lucy & Kitty" I keep thinking its an xmas one, its not but it *can* be! 5th is some scrummy glass beads including some two colour crackle glass ones, 6th is some accents (vellum stickers, sticky ribbon etc) by AMM, 7th is some epoxy? stickers of some gorgeous little cherubs and corners, 8th is 3d stickers and die cuts by craft house which I use quite a lot myself! 9th is a sakura stardust pen in clear and a souffle pen in white, essential kit! 10th is a packet of Dazzlers by Petaloo and also a scrummy pack of pink and black flora doodles. 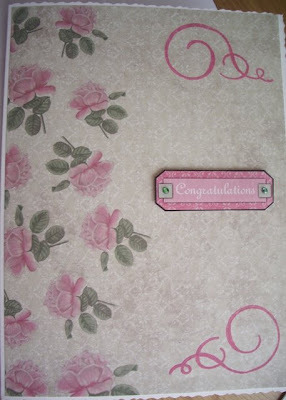 11th is 10 decoupage sheets by Jolly Nation with 10 matching backing papers. 12th is a pack of scratch art scratch & sparkle which can be used in basic, intermediate and advanced (all instructions included!) 13th is 2 bottles of Moonglow starburst stains (these are THE most gorgeous dyes on the market and I have 59 of them myself!) They are Poinsettia red gold and Cathedral pines green so perfect for xmas. 14th and final are some lilac and pink beads, heart shaped glass beads, some silver charms and some swarovski crystal beads, these really dazzle so use sparingly! There is a nice little mix of starter materials through to more advanced ones. I'll be taking entries up to 12pm GMT on Monday 10th Aug, all correct guesses will go into the draw for the winner to be announced later in the day. Keep guessing! You have to have the right answer to be entered so keep going! NOTE: Once you get both right your name will be noted so you can keep trying each day if you're not sure! It doesnt go on the final guess, once you hit on it then you're in the draw! Let me introduce you to our design team. We differ from regular design teams in that we are made up of very new and less experienced cardmakers up to more experienced. We will also be having an uber talented surprise guest each challenge so you will see a wide range of skills and levels that anyone can relate to. My name's Jack and I'm from Hampshire, UK. I've been making cards about 2 years now and LOVE stamping! I also do a bit of parchment craft and beading. I also like to get involved with card & ATC swaps on groups. I recently made my own blog so I will learn with you and have just taken the plunge to do my first blog challenge! My name's Mandy and I live in Birmingham, UK. I have been blogging for about 2 years and completed some guest designer spots. I have also had several cards published in the reader pages of various magazines! 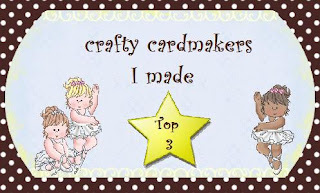 I have been making things since I was small but it wasn't until I saw a card making demo in 2002 and thought I could do that that I took up card making. I like trying different techniques and like bright and bold colours. I love taking part in blog challenges and love sketches as it gives me opportunity to try different styles. My name's Joy and I'm in my 70's! I live in North Devon, UK. I've been doing various crafts since I was a small child including crochet, machine knitting, embroidery and model painting and only recently took up cardmaking. I like being involved in swaps and this will be my first challenge. 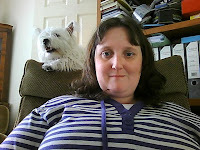 I'm Lisa and I live in Sheffield, South Yorkshire, with my husband Pav, our 2 little boys Morgan and Dexter and 2 cats. I've always been a fairly crafty person - I learnt to knit as a child and then moved onto embroidery. 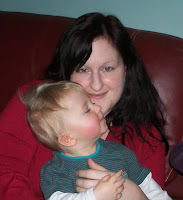 Just over 2 years ago we had a little boy, Harvey, who was stillborn. Needing something to focus on in the months following our loss, I wandered into a craft shop, found a cardmaking magazine and was soon well and truly hooked! I quickly progressed from one small craft box, to a set of drawers in the living room, to a whole craft room of my own, and I still don't seem to have enough room for everything. Crafty Cardmakers is my first Design Team position and I'm thrilled to be involved, I can't wait for the challenges to start! Hi My name is Rachel aka Loopy, I have four amazing children and have been married to Chris for fifteen years. the images and bringing them to life. I have to admit to being a gadget gimp and have many things I have no clue how to use. I will also admit to being a bit odd about card and paper stock, I hoard it then can't bear to cut into the special ones! My name is Toria also known as Vicky. I live in a lovely part of the UK - Pembrokeshire, West Wales. I have been into crafting for quite a few years now. I am very lucky as my Mum is into crafting too. I like to use a number of techniques among these are ribbon embroidery, Parchment Craft, Decoupage and stamping. But it is stamping that I really enjoy. Watercolour pencils, Polychromous pencils & Zest it Oil and Copic markers are my favourite mediums for colouring my stamped images in. I love glitter and try to add some to most of my designs so I always have my stardust clear pen near me at all times. I like quite a few stamp makers but Cute Companions, Magnolia and Katie Sue are my favourites. I am always eager to learn new techniques and improve those I already use. I also love to make miniature needle felted bears and chenille stem bears. My favourite colours are: Blue, Purple, Pink, Turquoise and Jade. It is funny how I keep coming back to these colours for my card making, but I try to make a point of using other colours if I can possible do so. My name's Rose and I live in Ohio, USA. I am a wife, mother of 2, grandmother of 4. I have 2 really spoiled Golden Retrievers. 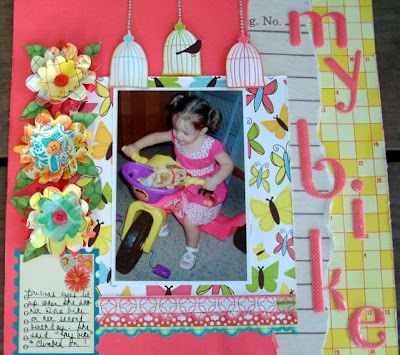 I have been scrapbooking and cardmaking for approx 12 years. My grandchildren are my main subjects. I am a Respiratory Therapist and work at the local hospital. My scrapping style is all over the place. I love the shabby chic, vintage look, but my grandchildren are bright modern children, so I go with that style mainly. 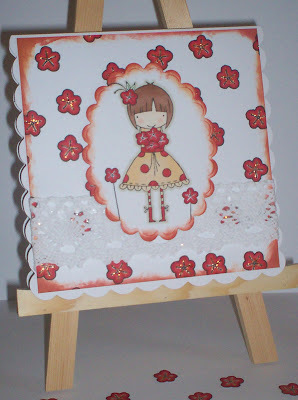 My name's Vix and I've been cardmaking for 6 years, stamping for 5. I previously did cross stitch but the results weren't quick enough for me so I switched! I've been a published designer for encaustic art, won several competitions including cardmaker of the year for Makins clay category and had numerous cards published in magazines. I love swaps and challenges and take part in several a month, I feel it improves your skills and gets you to think differently. I also like hooking up with craft buddies I meet around the net and have made tons of new friends. I like to experiment but they dont always go to plan lol! I also have a severe addiction to ink and dyes! My name's Jenny and I am a 33 and live in Wolverhampton. I have been attempting to make cards for the last 3 years, but not made many as tend I to do personalised ones, so this is a good learning tool for me. I work for a government agency, about to start a new job in 6 weeks. 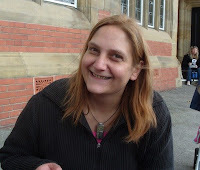 My name is Julie, I am 39 years young with a darling daughter who is only a darling when she is not in my craft box!! No we love crafting together (until she uses my favourite item). I have been crafting on and off for about 8 years now, I have gone through cross stitch, scrapbooks, sewing until I found card making and I absolutely love it. So much so for the past three years I have made my employers Christmas cards 1200 each year, ended up with sore fingers but got there in the end. I enjoy challenges. I hope you this site helps with any crafty problems you may have. I'm Judie and im 39 nearly the big 40 lol , Married to Pete for 21 Years, have 3 kiddies, Claire 20 - Scott 18 - Nicole 4 (we thought we were covered lol - wouldnt change it for the world though) - We are in Devon, but come from Hampshire. I do lots of fundraising for Meningits research Foundation, as i would love to see a vacination against all strains of this wicked disease, It can kill within 4 hours and im passionate about this big time. I love art and crafts end of , I now have a room to create in, I started making jewellery 3 years ago, I often make and sell these items now, I happened to buy a mag to make a valentines card for hubbie in 2008 so that would be febuary, and i have been hooked ever since, I have found it had to break into the docrafts site, as i dont have enough for the challenges on there, for example i entered PB challenge, this card took me all week only to be told that i must use a PB stamp !! I love to do challenges, but its hard to do when you dont have the stamps, I have done the wallet swap on there and that was good, I have also done the diecut swap as well, I havent got a fav technique, im really into trying any thing at the moment as i still consider myself a newbie, some of the cards out there are stunning it will be a while before I am in the bottom of that league lol - I think though im more of a sticking and glueing card maker not a stamper yet - Need to get my head around the copics and promarkers first.